I ’m a fan of Oren Moverman’s The Messenger, especially for its standout performances from Woody Harrelson and Ben Foster and for the highly charged material: military men whose duty is to inform relatives that their loved ones have died in service to their country. Each visit to a new house is a new opportunity for drama, and the way the job wears on the characters is nicely reflected in their changing relationship. Structurally, the movie is fairly loose and episodic, but it doesn’t seem to matter much. Each visit to a new house is like a separate story in a collection, all of it held together by the changing relationship between the men and by the romance Ben Foster’s character finds. As always, Foster, too, is excellent, though he has too little to do this time out. And Cynthia Nixon and Anne Heche, as Brown’s ex-wives who also happen to be his ex-sisters-in-law, play their parts with a compelling mixture of anger and regret. Robin Wright also gives a strong performance as the mystery woman Brown meets in a bar. And there are surprising cameos from Steve Buscemi, Sigourney Weaver, Robert Wisdom, and Ned Beatty. Where the film goes soft, it seems to me, is at the level of story. The episodic quality of The Messenger seems justified by the material. But in Rampart, the disconnected quality of the scenes gives the film the feel of an actors’ showcase, an elaborate reel to show off the actors’ talents. We know Brown’s marriages have fallen apart, and that his ex-wives are tolerating his bad behavior less and less. We know also that he’s being investigated by the force for his excesses. But these conflicts seem isolated. They don’t build enough. The internal affairs investigator turns out to be only the most minor of characters. Even when he finds the evidence he needs to put Brown away, he inexplicably decides to wait before arresting Brown. I think I know why Moverman puts plot on the back burner. I’ll bet he didn’t want to be caught up in a tedium of a police procedural, the kind of thing we see on most TV cop shows, where most of the dialogue is exposition parceled out to two-dimensional characters. Instead, he wanted to focus on the corrupt cop as a tragic hero, giving him room for his rage and shame and self-pity: Lear on the heath . . . with a badge and a Glock. A film that’s too heavily plotted might not have given his actors room to vent. Still, his choice makes for a film that doesn’t build so much as repeat its key points. In other words, it has all the character it needs, but it lacks the proper combination of story, structure, and momentum. Hard to blame Moverman, when so many Hollywood movies have structures that seem to have come off an assembly line and characters whose back-stories are about as thin as their Lycra body suits. 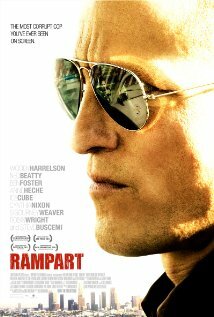 And Rampart is better than most movies out there. Still, I was hoping for more.